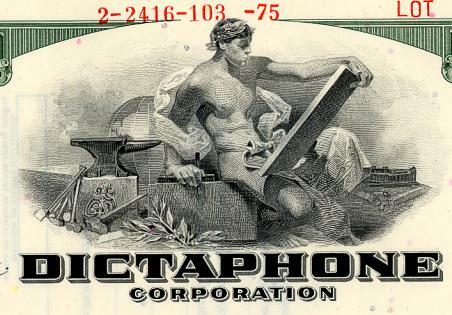 Beautiful engraved specimen certificate from the Dictaphone Corporation dated in 1975. This historic document was printed by American Bank Note Company and has an ornate border around it with a vignette of an allegorical man. This item has the printed signatures of the Company's President and Secretary and is over 41 years old. The name "Dictaphone" was trademarked by the Columbia Graphophone Company in 1907, which soon became the leading manufacturer of such devices. Dictaphone was spun off into a separate company in 1923 under the leadership of C. King Woodbridge, whose brother-in-law, George Albert Kimball successfully designed and built both the sewer system and then the subway system for the city of Boston. A Dictaphone advertisement from 1917After relying on wax cylinder recording through the end of World War II, in 1947 Dictaphone introduced their Dictabelt technology, which cut a mechanical groove into a plastic belt instead of into a wax cylinder. This was later replaced by magnetic tape recording and eventually hard-drive recording. During the following years, Dictaphone sold a range of products, including voice recognition and voicemail software. In 2000 Dictaphone was acquired by the then-leading Belgian voice recognition and translation company Lernout & Hauspie for nearly $1 billion. Lernout & Hauspie provided the voice recognition technology for Dictaphone's voice recognition enhanced transcription system. Soon after the purchase and triggered by an increased ownership of US companies�following the purchase of Dictaphone, within a month Lernout & Hauspie purchased its main voice-recognition competitor in the US, Dragon Systems, who has since been acquired by Nuance Communications, Inc.�the SEC raised questions about Lernout & Hauspie�s finances, focusing on reported income from its East Asian endeavors which seemed to sky-rocket during these times. Subsequently the company and all its subsidiaries were forced into bankruptcy protection (Chapter 11 for US assets such as Dictaphone). CRS - Communications Recording Solutions. Focuses on recording Phones and Radios in Public Safety Organizations and Quality Monitoring solutions for Call Centers. In June 2005 Dictaphone sold its Communications Recording Solutions to NICE Systems for $38.5 million, which was considered a great bargain in the industry. It has since focused its goals in speech recognition for the healthcare industry with only limited success, mainly building on its well established brand name. In September 2005 Dictaphone sold the IVS Business outside USA to a Swiss Company Dictaphone IVS AG in Urdorf Switzerland (today called Calison AG) who developed the first hardware independent dictation management software solution "FRISBEE" with integrated speech recognition and workflow management. In February/March 2006 the remainder of Dictaphone was sold for $357 million to Nuance Communications, formerly known as ScanSoft, ending its short tenure as an independent company it started in early 2002 and effectively closing a circle of events it started in early 2000 by being sold to Lernout & Hauspie (assets of which were sold to ScanSoft/Nuance in the events of early 2002). Dictaphone has now become a division within Nuance Communications, and in March 2007 Nuance acquired Focus Infomatics to further expand in the healthcare transcription business. In most recent financial results non-GAAP revenues were at $56.9 million in the quarter (March 2007-June 2007), including the contribution of Focus and up 31% over the same revenue last year. Excluding the benefit of Focus, Dictaphone revenues were $51.4 million, a record level for the Company and up 18% organically from a year ago.